I rarely eat take aways anymore, mainly because the choice often comes down to which one of the three Ps I want to subject myself to – a piss poor pizza, poppadom or prawn roll. This partnership with JUST EAT gave me the opportunity to try a Lebanese take away from West End restaurant Maroush V, just off Oxford Street. Why Lebanese? Apart from not being one of the three Ps, Lebanese food is vegetarian-friendly and gluten-light – essential for my delicate veggie dining companion the Flame Haired Squelchie. Plus, it also has the benefit of being light – a bonus during the balmy, tropical weather in London at the time of dining. Joining the Squelchie and I was Templeton Peck, a fellow carnivore. 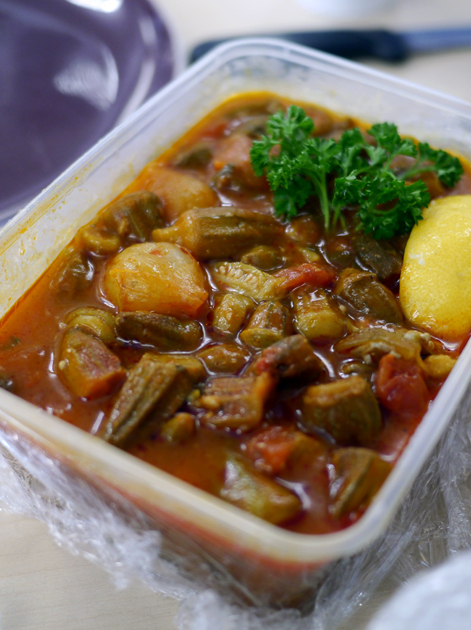 Maroush’s takeaway and eat-in prices are identical and delivery requires a minimum order of £25. Our order arrived within 45 minutes of ordering which was impressive, but then again our West End safe house is a mere six minute drive or 13 minute walk away from the restaurant. 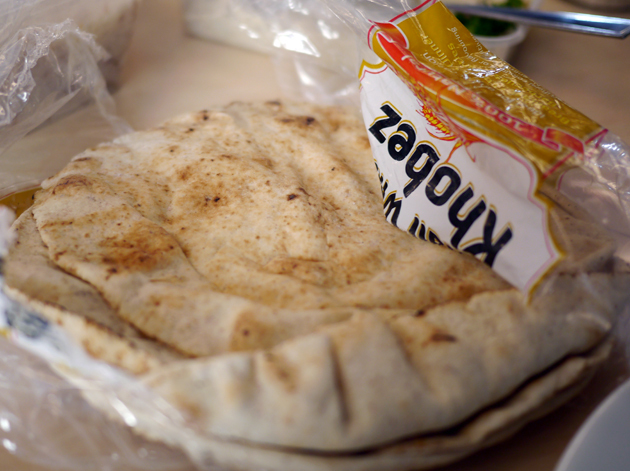 Thrown in for free with our order was a large supply of rather chewy kobez flatbread and a tzatziki that was far too watery which did not impress the Squelchie who has roots in the Near East. At the risk of being patronising, that’s a Roman numeral five, not a ‘vee’. Wait, someone screwed up yoghurt? Templeton and I shared the Lisanat, or lamb’s tongue. 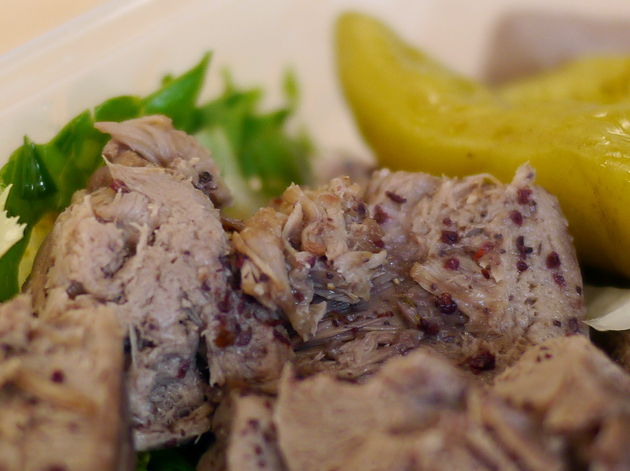 The plain, coarse, offaly bits of meat tasted strongly of lamb and resembled liver. Not awful, but not especially remarkable either. I will cut out your tongue. Templeton and I also shared the Kibbeh Saynieh. 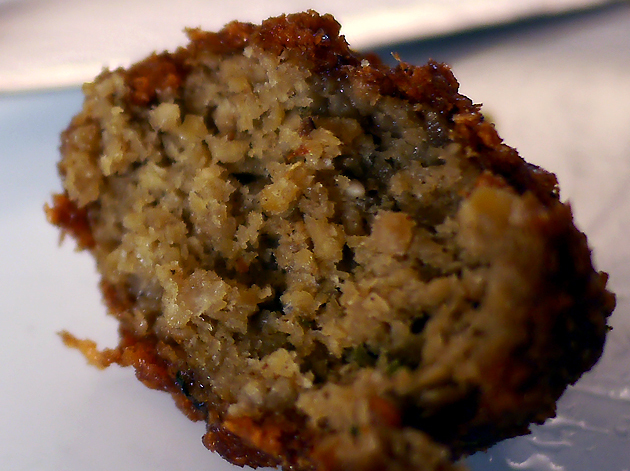 I was expecting small, crisp rugby ball-shaped parcels of deep fried minced lamb and cracked bulgur wheat. What we got instead was an odd pie-shaped dish. It wasn’t bad, but it wasn’t terribly impressive either. 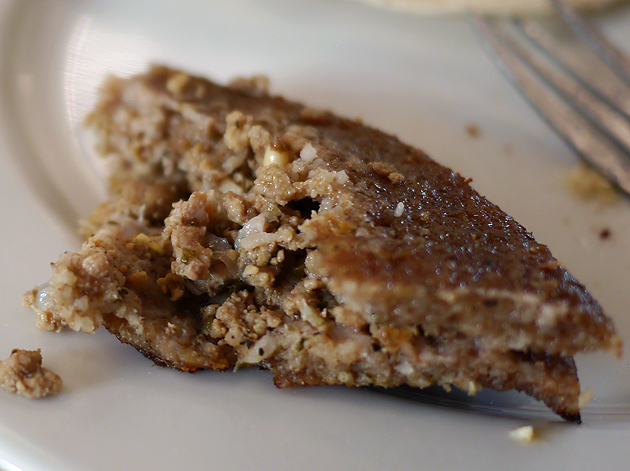 The grainy mince looked and tasted like subpar haggis filling. I can make a tin foil hat out of that tray! I should have washed my new tin foil hat before wearing it. The quality of the vegetarian dishes was extremely variable. Squelchie was unimpressed with the okra stew which curiously had the addition of pickled silverskin onions. The small baby okra used was too slimy, which some may prefer but the Squelchie doesn’t. The thin tomato-ish sauce did little to redeem this rather disappointing dish. Comes with rice flecked with small pasta shells. Both Templeton and Squelchie were turned off by the Fattet Hummus B’laban, a mixture of boiled chickpeas, fried bread, garlic, yoghurt and pine kernels. Templeton likened it to cat vomit which I think is a bit harsh (plus I’m fairly certain Templeton has never willingly eaten feline sick). The stodgy bits of oily fried bread were unpleasant as was the slightly squidgy texture of the chickpeas, but the tart yoghurt mixture made it all kind of palatable. 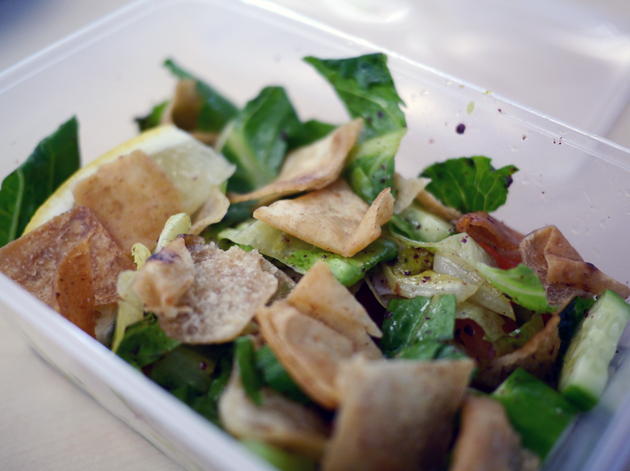 The fried flatbread turned up again in the fattoush, a salad of lettuce, tomato, cucumber, mint, onion, radish and summac all dressed in lemon juice and olive oil. Squelchie and Templeton were more fond of the fried bread than I was, but we all liked the fresh, light and zesty vegetables. The endless series of combinations that is the salad. 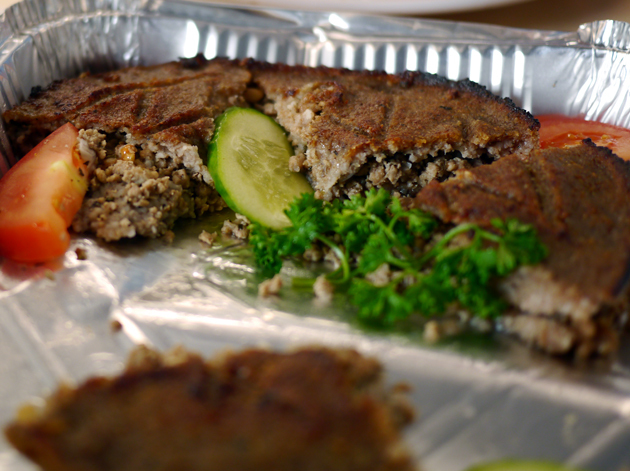 The most successful dishes of our meal were a trio of Lebanese classics. The Hummus Beiruty sounds comical, but the layering of hummus and tahini was flavourful and packed with a surprising amount of chilli heat and lots of fresh parsley. Hummus beiruty? That’s a name? Really? 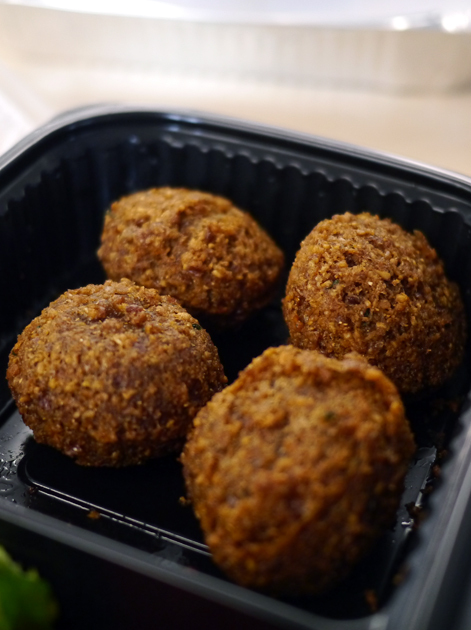 The falafel wasn’t the best we’ve had in London, but it was crisp on the outside, reasonably fluffy on the inside, free from excess oil and had a reasonably strong taste of chickpea. 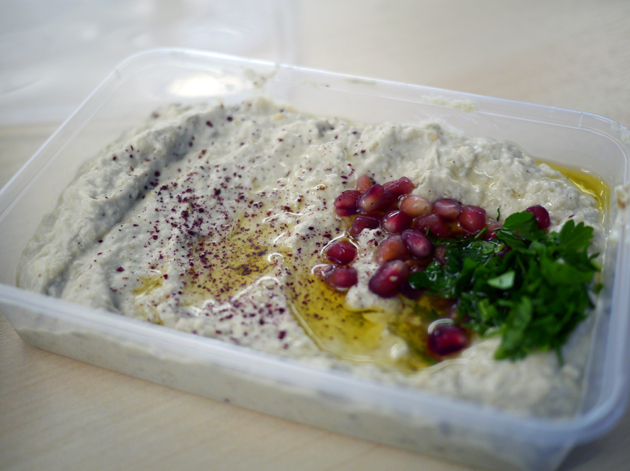 I’m a big fan of mutabbal/baba ghanoush, a puree of aubergines, tahini and lemon juice. The version here was a little muted in flavour, but it was still creamy with a light smokiness to it. All your eggplants in one basket. 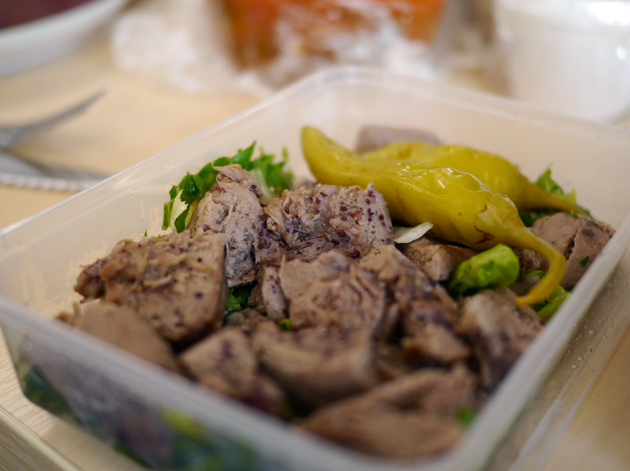 Our takeaway meal from Maroush V was unimpressive with the food varying from poor to middling. This would’ve been easier to swallow at low cost, but the overpriced bill was just too much for such a disappointing level of cooking. Should’ve had one of the three Ps instead. Total cost for one person excluding drinks and tip when shared between three: £22 approx. 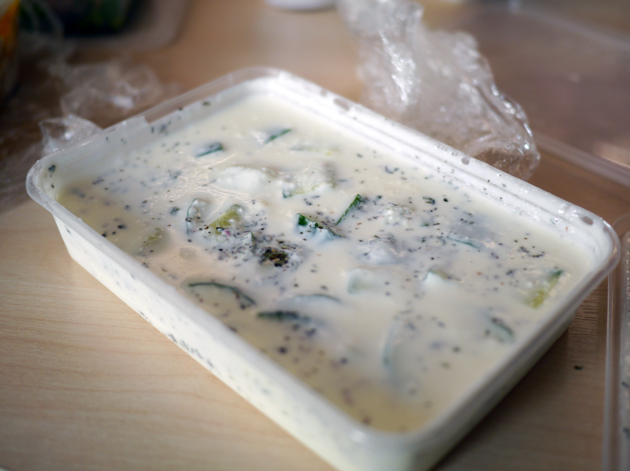 Tags: aubergine, eggplant, falafel, hummus, london, maroush, okra, review, salad, take away. Bookmark the permalink. How disappointing, though the baba ghanoush looks really good. I’ve found the Maroush chain of restaurants to be a bit hit and miss over the years, though Sidi Maarouf is usually pretty good (see http://wp.me/pCISV-cd). Nice review, thanks for sharing Picky Glutton!